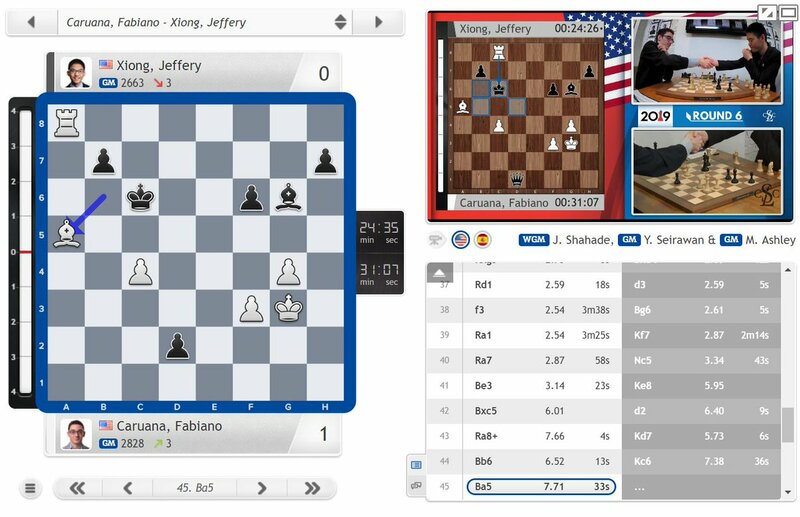 Fabiano Caruana’s drought finally ended as he beat Jeffery Xiong in Round 6 of the 2019 US Chess Championship to score his first classical win in 28 games and 5.5 months. 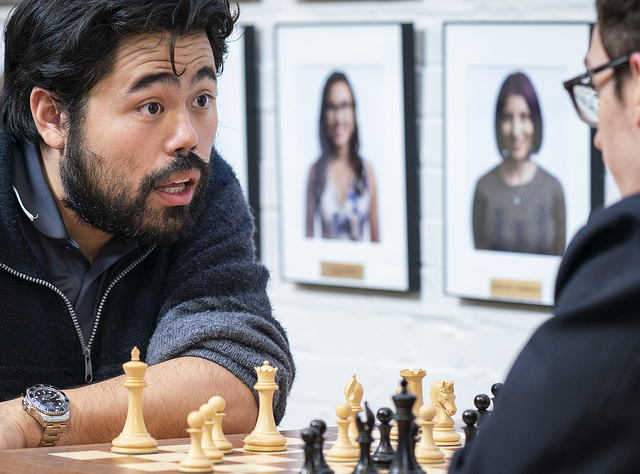 It was enough to take him into a 4-way tie for second place with Leinier Dominguez, Wesley So and Sam Sevian, since Hikaru Nakamura beat Timur Gareyev to take the sole lead on 4/6 going into the rest day. 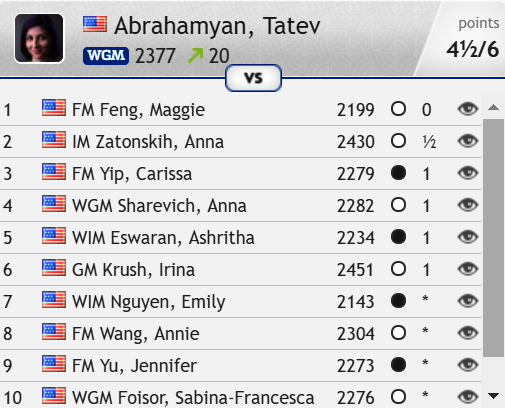 In the women’s event Tatev Abrahamyan now has 4 wins in a row while Anna Zatonskih is on 5/6, but they’re still trailing 17-year-old Jennifer Yu and her stunning 5.5/6. Nakamura spent 50 seconds, an eternity for blitz, before eventually going for 12…axb4 and making a draw, but Jeffery seemed unaware of that game and chose 12…Bb6!? instead after 15 minutes. It wasn't an improvement, and Fabiano explained afterwards that although Black gets play on the queenside it’s not really going anywhere, while White’s kingside attack is slow but hard to stop. Fabi here gave up the a-pawn with 30.Rag1, describing it as “not a difficult sacrifice”, since after 30…Qxa4?! 31.Ne7! it was essentially game over – avoiding material loss with 30…Re8 would only bring Black pain and suffering on the g-file after 31.g5! 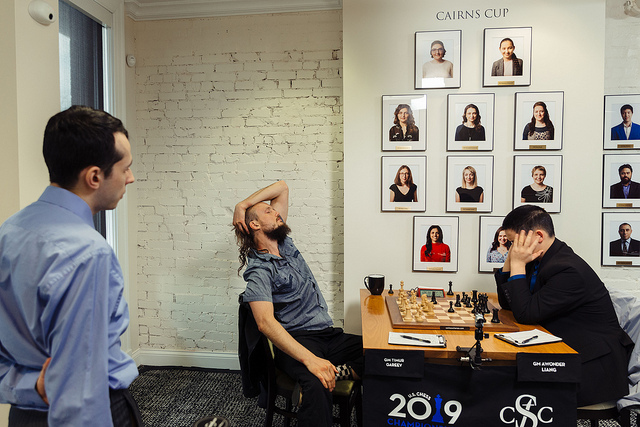 Xiong played 31…Qd4 and was soon in a hopeless endgame, and this time Caruana made no mistake finishing things off. 45.Ba5! was a last twist of the knife! Caruana commented, “it’s not necessary, but it’s really clinical!” 46...Rd8, giving up the bishop, would also have got the job done, but this way Black can queen the pawn only to see the new queen picked up by 46.Rc8+ and 47.Rd8+. It feels really good. It’s been a long time, about 7 months since I won a classical game. It feels good, and I think overall it was a good game. After 46.Qxe2+ Kf8 White was forced to play 47.Qxd2, allowing the fork 47…Ne4+, but although one queen bit the dust, the a5-pawn was unstoppable. 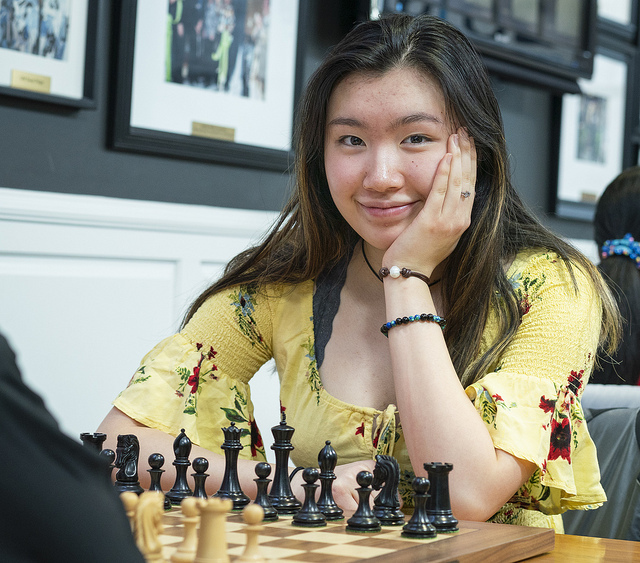 The hero, however, remains 17-year-old Jennifer Yu, whose chances of winning the $64,000 Bobby Fischer prizes were extinguished with a draw in Round 5. She “bounced right back”, though, to win a fifth game in Round 6, with her confidence that she could outcalculate her opponent leading her to spurn a winning line! 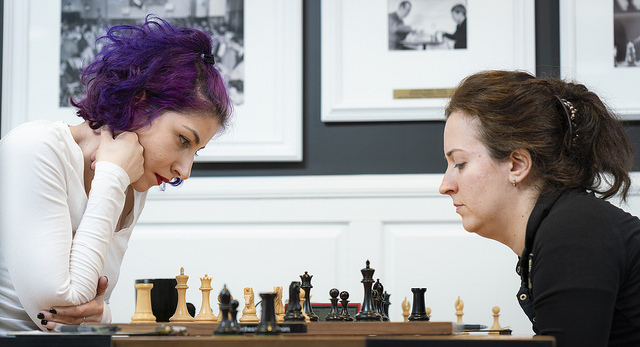 Jennifer has a 1-point lead over Tatev Abrahamyan, but is only half a point clear of 4-time US Women’s Champion Anna Zatonskih, who has won all four of her games with the white pieces.